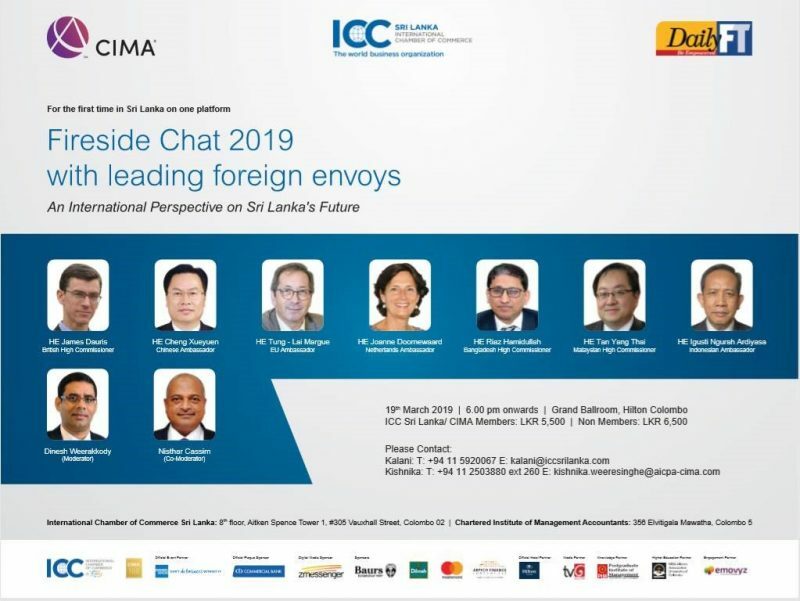 March 20, 2019 (LBO) – The business community in Colombo on Tuesday evening was geared up for 2019’s fireside chat organised by the DailyFT and the International Chamber of Commerce (ICC). 2019’s event in a packed Hilton Ballroom came after 2018’s successful event which featured Sri Lanka’s biggest businessmen. Last year’s event made headlines and stirred up its fair share controversy. Tuesday’s Fireside Chat featured envoys from the United Kingdom, Indonesia, China, Bangladesh, Netherlands, Switzerland, Turkey, Canada, Malaysia and the European Union. One of the moderators, Nishtar Cassim of the DailyFT, made clear from the start that the discussion should be collegial in nature. He wanted envoys to be able to speak frankly and for statements made by the envoys not to be taken as interference in the internal affairs of Sri Lanka. The Ambassadors and senior diplomats made some key points in their remarks which were aimed at helping Sri Lanka to advance as a nation. British High Commissioner James Dauris made a key point that Sri Lanka should focus on sustainable tourism instead of sheer number. Dairies, an active photographer of flora and fauna of Sri Lanka emphasised environmental protections to coincide with growth in the tourism industry. Joanne Doornewaard, Ambassador from the Netherlands, pointed out that there seem to be too many taxes in Sri Lanka. She mentioned that she as well as other tourist compare prices and Sri Lanka is expensive in comparison to countries like Thailand. She gave a scenario where a week in Sri Lanka would be priced as much as 2-3 weeks in Thailand. Turkish Ambassador Tunca Ozcuhadar on connectivity. He mentioned that transit times between locations need to be shortened and public transport needs to be significantly improved. The High Commissioner from Bangladesh emphasised agricultural development that would create wealth for the rural masses in Sri Lanka. On his experience in Sri Lanka, the Swiss Ambassador Hanspeter Mock in a lighter vein said that shortly after he arrived in Sri Lanka, he was greeted by a 52 day crash course in Sri Lankan politics. As a group all the envoys were optimistic on the future of Sri Lanka and encourage the country to be open to trade and collaboration with their respective countries.